The patent for this novel saw was registered by Percy Adrian Aubin in 1927 and 'completely accepted' the following year. The patent is headed 'Improvements to or relating to Tenon Saws'. I first discovered this strange looking saw with the blade missing at my local Sunday boot sale and knowing how difficult it would be to find the correct blade, put it to one side, keeping it just as a curio to show people. Later by chance, I saw a complete saw exactly like mine at the Tool Bank Museum in Dartford. The blade was just like a hacksaw but much thicker with quite fine teeth, surely I could find something similar to get mine working. If you have ever tried to cut combing joints by hand you will soon realise this joint is more suited to a machine, unlike the dovetail joint, which seems to lend itself to hand work. Maybe this is because the grain of wood is in-line whereas with a dovetail it is slightly across the grain. 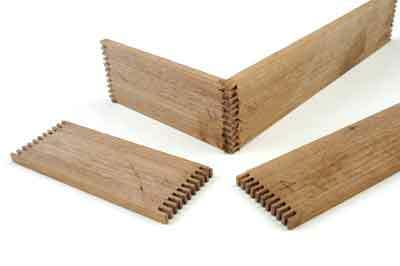 Years ago, I was offered a set of combing cutters to fit my spindle moulder; they are suitable for a joint 125mm long. I seldom use them, however, because they take so long to set up, but I have to say that they do make an excellent joint. The blade for this saw is only 200mm long, which meant cutting shorter a 305mm hacksaw blade and drilling a new hole for the fixing screw. I found by putting two of the older style black blades together the thickness was just right for the saw. That type of blade also happens to be just soft enough for drilling without the bother of de-tempering them. 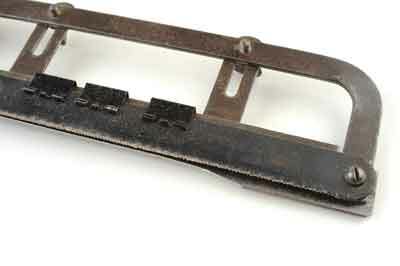 The small bulldog clips are there to stop dust getting between the blades and the depth stop, a similar clip is shown on the patent. The saw looks like a cross between a tenon saw and a hacksaw with a nice open wooden handle and a bent steel frame; a guide fence is fixed alongside the cutting blade and registers into the previous cut. The adjustable stop controls the depth of cut, which needs to be a little more than the thickness of the wood in use. The guide fence has a toe piece at the front, making it possible to start each cut easily. 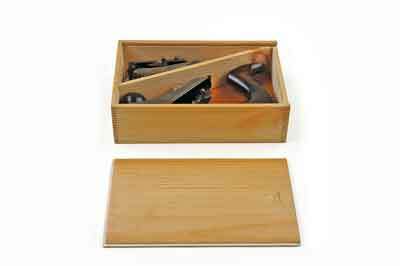 It is the perfect tool for cutting joints for small boxes or trays from wood about 7mm thick or less. 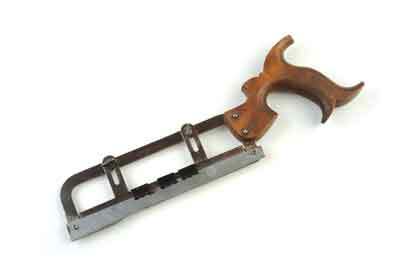 This very simple and easy to use saw would be so easy to make today, so why has no one thought of resurrecting Aubin's clever idea?